In November we were treated to a very successful day at the super new section of Exeter Racecourse. Despite the pouring rain outside, the atmosphere in the building was warm and welcoming. We occupied 2 spacious rooms, named after famous race horses, as well as enjoying the 3 traders in the wide corridor. Food, as always, was a delightful spread of goodies to tempt even the most serious dieter, with Dorrie’s Christmas cake being her usual ‘piece de resistance’. 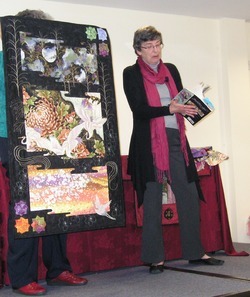 The first speaker was Anne Muxworthy from Step by Step at South Molton. She entertained us hugely with stories of how the idea for a patchwork and quilting shop came about. How she met Julia at a school PTA nearly 20 years ago, and how in 1997 -1999 they set about transforming the garage that Anne’s family had run into a patchwork shop. The shop opened in 1999 with 500 fat quarters, all of which had been ironed by hand. Truly a labour of love! 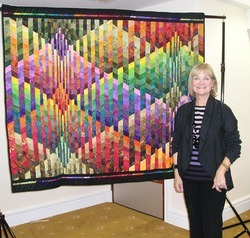 Amusingly, Anne’s first quilt had been a 9 patch block made from curtain fabrics! She still likes to piece by machine and quilt by hand. She showed us many of her own quilts, all of which seemed to have a story to tell. The shop then became a centre for patchwork classes and was full, finally, of bolts of fabrics, as the ladies had ploughed all the profits back into the stock. In 2003 they had the disaster of a broken water pipe flooding the shop, which they had to empty of stock. During the refurbishment period a purpose built classroom was added on to the back of the shop, which expanded the floor area. Despite set backs the ladies have made Step by Step into a specialist shop for Japanese and Oriental fabrics. They can often be seen at shows and exhibitions wearing their own Japanese waistcoats, where their stand will be decorated with Geisha dolls, wall hangings and panels with an oriental theme. Anne ended her most entertaining and seemingly informal talk by sharing with us the fact that the publication of their new book is the culmination of the success of their business. They were to be seen at 24 venues last year, and you will, no doubt, be able to locate them at many shows and exhibitions this year. The members were all saddened to hear that Julia had just lost her husband Robert a few days earlier, and SWQ’s good wishes were sent to her. Jan Hassard, the afternoon speaker, only just made it to the meeting, as she had to change cars when she discovered a puncture. No easy task of moving the mountains of quilts she brought to show us. Jan’s talk began with a selection of Heritage quilts, and I can only think that her interest in quilts was born when, as a child she was bombed out and the family received a Canadian Red Cross quilt. Out of the many thousands of these kinds of quilts sent to England only a very few remain. However, Jan had one! We were treated to Amish quilts, African/American quilts, Log cabins and 1930s quilts. Then came a selection of quilts bought from Jen Jones and more Welsh quilts. American and English as well as French quilts were displayed from Jan’s seemingly endless collection. Then came a lovely collection of Jan’s own quilts. She loves angles, lines a strata and the quilts reflected this love. 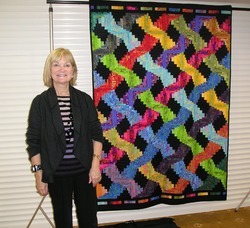 She also showed 2 Art Quilts and a beautiful quilt from Susan Denton called St. Ives. Jan’s quilts are always a delight to see, no matter how many times you see them. I am totally in awe of her collection…….she must have more storage in her home than I do, as well as a husband who actually helps her build her collection. A big thank you to all the ladies who turned up bringing the bags they had made for the Bag Raffle at Westpoint in March. They are simply gorgeous, I was overwhelmed by their craftsmanship. Come and see for yourself in March, and maybe you’ll win one!